1. Wrap bandages tightly around your body and pin in place. 2. Cut out your internal organs and extract your brain through your nose, dividing them and carefully placing them in the canopic jars. 3. Douse yourself in the #sacred embalming oils while reciting B’shabtu’s chant of preservation. 4. Place the golden mask of the sun on your face while reading from the yellowed pages of the book of Azaf’tet, nail it into your skull. 5. Gather all of your most precious belongings with you, ready for your trip into the Underworld. 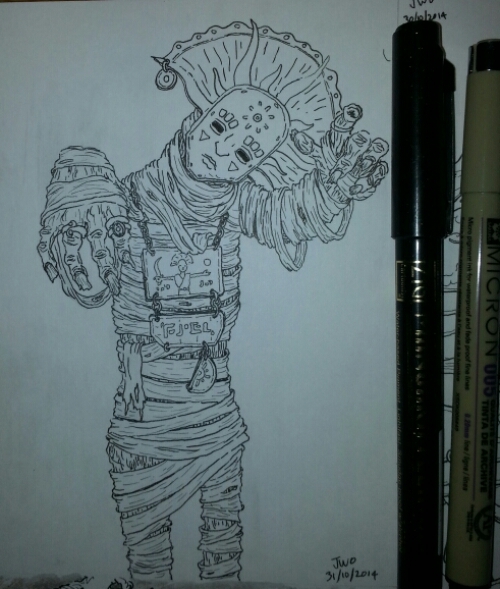 This entry was posted in Inktober and tagged 13th Age, Art, Artists on Tumblr, Canopic, Costume, Creepy, D&D, Dungeons & Dragons, Egypt, Halloween, illustration, inktober, kuretake, Mangaka, Micron, monster, Mummy, Pathfinder, Pigma, Scary, Spooky, Spoopy, Undead, Zig. Bookmark the permalink.